A beautifully wide and impressive double sided fireplace that gives a wonderful and expansive view of the flames. In this particular installation, the unusual wall material surrounding the fireplace, was also undertaken by us and is from blue steel which is an untreated steel that has amazing depth of detail. 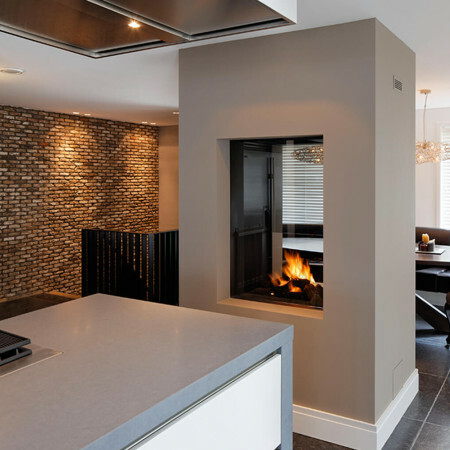 This double sided fireplace could equally be built in using standard building materials and like other double sided fireplace, is the perfect solution to breaking up a space and adding a cosy, contemporary feature viewable from both spaces. Like all of our fireplaces, designs can be highly customised and if you are interested in a double sided fireplace, we would love to hear from you. To speak to a Design Consultant please get in touch.